Paul de Gregorio posted this on his blog yesterday and called his post, Showing Alzheimers. Great description of a great campaign. Working aged men (25-54 years old) account for the largest number of suicide deaths in Colorado. These men are also the least likely to receive any kind of support. They don’t talk about it with their friends. They don’t share with their family. And they sure as heck don’t seek professional treatment. They are the victims of problematic thinking that says mental health disorders are unmanly signs of weakness. And I, Dr. Rich Mahogany, am dedicated to changing that. Part of a multi-agency effort, including the Colorado Office of Suicide Prevention, Carson J Spencer Foundation and Cactus, Man Therapy™ is giving men a resource they desperately need. A resource to help them with any problem that life sends their way, something to set them straight on the realities of suicide and mental health, and in the end, a tool to help put a stop to the suicide deaths of so many of our men. Did O2 UK get it right or wrong? What seems to be worse for Taylor, is that the follow up to the issue was slow and unapologetic. They offered a thank you (for bearing with us) and £10 priority moment credit, and it took a week for this to happen. 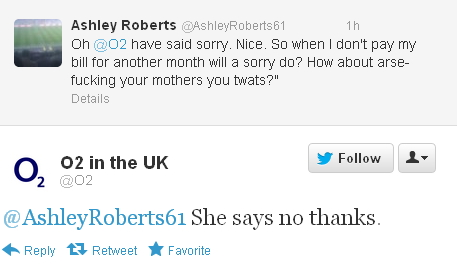 Now I am not an O2 UK customer, I am a huge fan of the brand, and imagine this is a blip. But will it do lasting damage? I suppose the good news for O2 is other networks wont be able to come out and say “Come over to us, this will never happen if you join our network“…coz it probably will! What do you think? The first self playing piano to take requests through twitter. Sorry, I know there has been a lot of videos on here lately…but how cool is this? There are some good examples of sports franchises using their sponsorship asset for a CR programme (eg Barcelona, Livestrong Sporting Park). But this seems one of the best thought through. 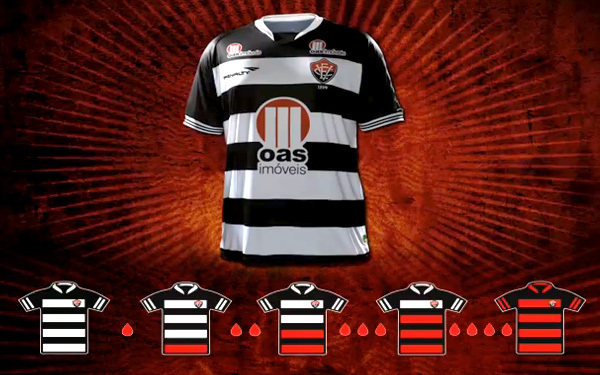 Brazilian Serie B side Vitoria are doing a blood drive and have thought up a really clever way of activating it. Instead of getting players to front a traditional awareness campaign (think tv ad, outdoor, photo call etc..) Instead they have taken their jersey, which is normally red and black, and they have ‘drained’ the red hoops from their home strip to raise awareness and get their fans to donate blood. The red hoops on the home shirt will then be replaced one-by-one as the level of blood donated rises, until the shirt is eventually restored to it’s former glory when the target is met.